Thinking about worship: What ideas, questions and principles underpin our thinking about children and worship? Worship services: How do we structure our worship to include both children and adults? Elements of worship: Ideas for confession, prayers and creeds as part of All Age Worship. Prayer Stations: Using prayer stations as part of All Age Worship. Baptism: What does it mean to be baptised? How do we include children in our celebrations of baptism? 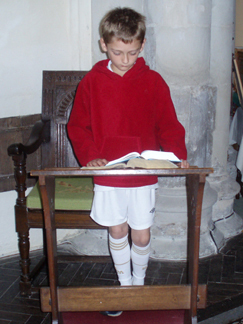 Holy Communion: What part can children play in services of Holy Communion? Under 5s: Ideas for nurturing the spiritual development of children under 5. Children's play areas: Using toys, symbols and other materials in children's areas in churches. Liturgy boxes: A box of objects and symbols to help children join in worship. 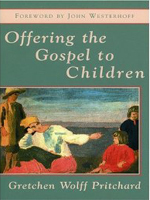 In Offering the Gospel to Children, Gretchen Wolff Pritchard challenges our attitudes to children's work. She asks that we stop hiding children in the church basement, telling them distorted stories from a kiddie Bible while emphasising moral points. Instead she asks us to offer children the real gospel, which includes both good and evil, easy and difficult, light and dark. 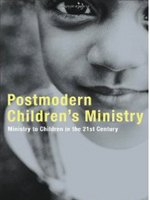 In this book she offers many practical suggestions and ideas that she has tried out herself to help churches engage with children in this way. 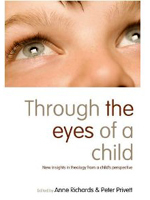 Through the eyes of a child is a collection of 14 essays looking at theological themes from a child’s perspective. Published to mark the 30th Anniversary of the International Year of the Child in 1979, the essays consider children’s spirituality, the position of the child in church, the theology of the child, the child’s voice and our ambivalent attitude towards children. Essays include Creation, Play, Sin, Grace and Judgement and contributors include Keith White and Rebecca Nye. In this book Ivy Beckwith contrasts modern and post modern thought; in particular the latter’s lack of certainty and need for narrative. She highlights the need to rethink the position of children in our churches - how do we ensure that children are treated as part of the whole church community and given opportunities for worship and service?